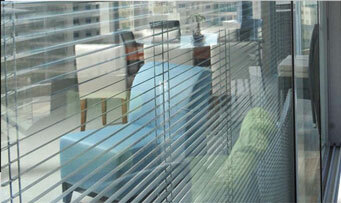 We produce UPVC windows with integral blinds. These can be used for window, doors and bi-folding doors. 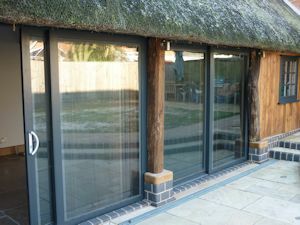 What is unique about UPVC windows with integral blinds is that the Venetian style blinds are actually installed between the two sheets of glass inside the double glazed sealed unit. So why go to such lengths? Well how about the house-owners’ dream of having great looking blinds that never require cleaning, protect your privacy and shield the inside of your room from the sun’s rays. This is an ideal solution, not only for conservatories, but they reduce the glare on the TV or in your eyes. Integral blinds provide both privacy and protection from sun light, without obscuring your view, but still allows light into a room. Unlike conventional blinds, you have the advantage of having the blinds inside sealed units is that they don’t require the constant dusting and maintenance. You can obscure the view of prying eyes, without the need for opaque glass to impair your own view. Movement of the integral blind is controlled using rotating magnets. This allows the blinds to be controlled from outside the sealed unit, thus leaving the blinds and the inside of the unit perfectly sealed.